These wire earrings are actually the result of some experimentation gone wrong … but I can’t say that I am sorry because I love how they came out! I originally was experimenting with Tunisian crochet with wire but wasn’t liking how it was coming out, so I fastened off and just started fiddling with the piece I made. And when I rolled it up I really liked the look of it! So I sat back down and made these earrings, but this time I just stuck to basic crochet stitches. Row 1: Work 1 sc in 2nd ch from hook and each ch across, turn — 15 sts. Row 2: Ch 1 (does not count as st), work 1 sc in each st across, turn — 15 sts. Now is the fun part! Roll the piece into a long skinny strip and then gently fold to make a tear drop shape. Use the tail to join the ends together. Add a crimp bead to the tail. Weave tail through the ear wire and back through the crimp bead. Flatten crimp bead to secure tail. Cut tail right after crimp bead or weave it into the earring. Click here for more free jewelry patterns. Adorable. I have been wanting to try wire crochet. I also want to try to add some small sparkly beads to the wire. Thanks for the great tutorial. So happy you like it, Karen! Gorgeous and Lovely! Thanks so much for linking up on Hookin On Hump Day! Those are really cute! I seriously have to combine my two passions and do some wire crochet! Thanks for the inspiration! OMG I LOVE these! I’m whipping some out this weekend too! Hi Kara, this earrings are so beautiful! I am making some this weekend! I was looking for a simple pattern and size suggestion to try my hand at wire crochet. 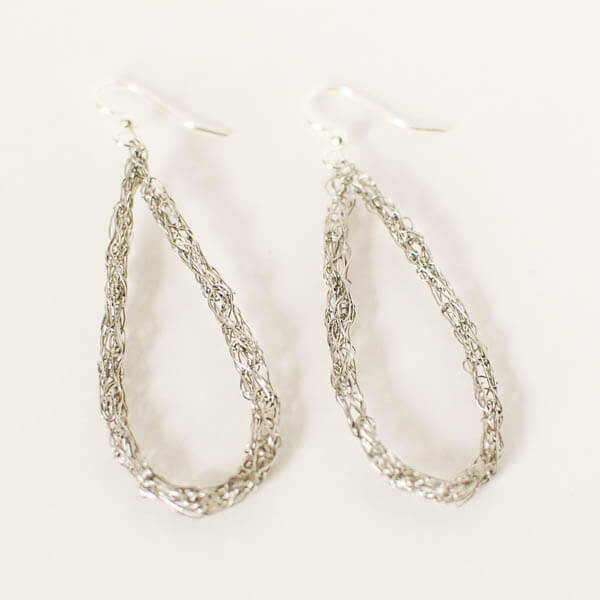 And your earrings are my style; I like the sparkle and seeming random curl and interweave of the wire. People will wonder how I tied all those intricate knots, and with wire. So glad you want to give them a try! I absolutely love them and wear them so much. Enjoy!